Many of us have been made aware recently of the vast problems the world faces regarding plastic waste, including the pollution of our oceans. As organisers, we’re very aware of the problems of single-use plastic cups; these turn into plastic waste which pollute our oceans. It’s shocking to hear that over 90% of plastic waste is never recycled, and that 8 million tonnes of plastic are added to the ocean every year. 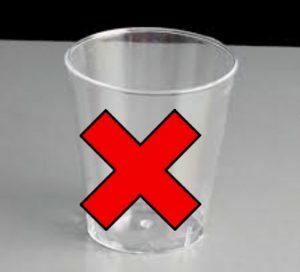 So, following the lead set by John and Karen in early 2018, we will introduce a plastic-reduction policy at our events, by encouraging our dancers to bring their own drinking vessels, and by charging £1 for plastic cups if you forget to bring drinking vessels. We will donate proceeds from plastic cup sales to the Marine Conservation Society – we will also have a collections tin at the front desk for you to donate to this cause. We aim to help people get into the habit of bringing their own drinking cups to events, as part of your standard “dance kit”, along with things like shoes and (we hope!) deodorant. This policy applies to all events we run – at Bookham and elsewhere. We aim to cut our plastic waste by 90%, please help us to achieve this. Also, we’re happy to see that other local organisers are starting to take similar steps, so ideally we can help influence and promote this as a trend for all dance venues. So: PLEASE REMEMBER TO BRING CUPS & GLASSES FOR YOUR FREE DRINKS.